Family, Stamping and FOOD! : Q&A: Do you use a Menu Planning System or Program? Q&A: Do you use a Menu Planning System or Program? Do you use a menu planning system or program? Sometimes I think it might be easier to plug the information into a system or program, but I'm way too much of a control freak to allow something or someone to plan our meals. Remember, I'm a couponer first and foremost. This allows me to stockpile rice, pasta, spaghetti sauce, frozen vegetables, canned green beans (this is my husband's only real vegetable he'll eat and he prefers them in the can), cereal, oatmeal and peanut butter (to name just a few of the basics). Chicken breasts (with skin and bones, I think they are more flavorful) when they are on sale for $.99/lb or less. I usually purchase 3 or 4 packages (each package normally has 3 large 1lb chicken breasts). Ground beef is rarely on sale, but the best price I've found was at our local Food Depot for $1.49/lb and I purchase 8 lbs. Fish fillets at $2.99/lb, I can find this at Food Lion and Aldi. Pork Chops are indeed rare for us. Sometimes I check the reduced bin at Food Depot or Kroger. They'll have it marked down to $1.99/lb or less and I'll get a couple of packages. Pork Roasts are perfectly priced on sale for $.89/lb or less. My goal price for whole chickens is $.79/lb but I've paid $.99/lb when I was in a pinch. When I find Beef Roasts on sale for $1.99/lb, I'll pick one up. Each month the grocery stores offer these items on sale. Some things are seasonal, like ground beef, but for the most part, you'll see the prices dip once or twice during the month. When you've decided what is the best price for you to pay for something, you should stockpile enough to get you through the month. Most stores cycle prices every 4-6 weeks. So you'll want to pick up enough at the best price until the next time it's on sale. I find spending about 30-60 minutes once a month, can reduce the stress of "what's for dinner" throughout the month. It saves on your budget, i.e. eating out, impulse buying...these can add up. The next step is to review what's in your freezer and pantry from the previous month's purchases. Some find it easy to keep a list of what's in the freezer so things don't get overlooked. Once you've used that item, mark it off your list. 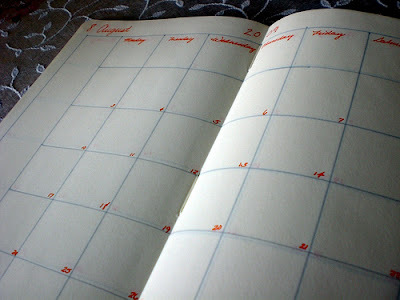 To make it even easier to plan meals, I specify certain types of meals for specific days of the week. Printing a calendar helps make this easier for me, but you can use a calendar you keep on your wall or in your purse. Check the calendar for special occasions, gatherings, date-nights, out of towners and what not. Mark the calendar so you'll not have to plan meals for those nights. This changes monthly, but Wednesday and Friday are almost always the same. I have several cookbooks I reference for new recipes. I also regularly check food blog carnivals, you can find delicious tried-and-true recipes with detailed instructions on how to prepare the dish. You can find a list of those carnivals at the bottom of most of my recipe posts. And of course, I love the Food Network, and often get inspiration from the many chef's recipes. Sometimes I need to tweak the recipe to feed my family, but it gives you starting place. So that's it in a nutshell. I hope you'll give meal planning a try if you're not already doing so. I would suggest starting out with a simple weekly plan so you don't feel overwhelmed. Once you get that down pat, you can try to be a little more adventurous by planning 2 weeks worth of meals. After that, you'll be ready for monthly planning. It's really not that hard, in fact, I'll have been planning our monthly meal plan for an entire year come December! And I can tell you, it's been working for me for a year! Great ideas, I do something similar, I see what we have in the freezer, garden, etc. I also shop the sales, and I then pick something we are hungry for or new recipes I've found from blogs. Menu planning is essential I think. I'm so glad that you posted this! I'm just making some changes to our schedule of meals. I looked at our bank statement, and realized just how many times I had been going to the grocery store. YIKES! I have made a baby step by making a meal plan for a whole week, and decided I cannot go back to the store until a week later. Now, I have been using coupons, and I'm doing pretty good there. I need to do better. One week will turn into two weeks, will turn into more. I just use paper and a calendar at this point. I love to write it down (paper and pencil for me). Good for you! It's amazing how much we end up spending each week without much accountability. What a great bunch of tips! I "liked" this in my reader to refer back to for sure!